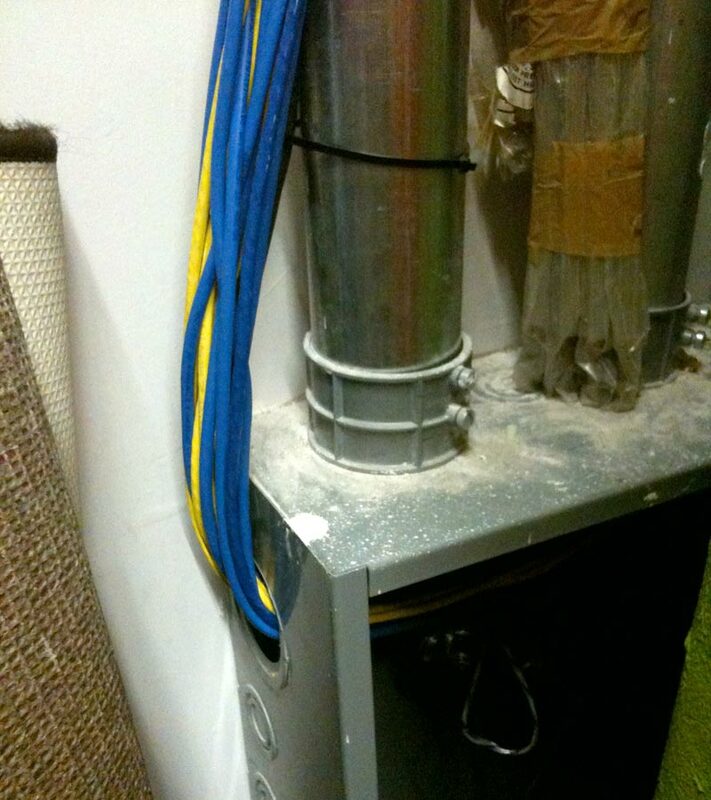 Today, we're starting a new series: #InstallationFail. It's been inspired by the many, many instances of bad installation practices I've seen throughout the years. I've been taking pictures and cataloging these for quite some time, and I figured it's time to share them with the world. Now, I should point out I'm not publishing these to make anyone feel bad. Though some of you should feel bad for some of these installations. But that's not the point. The point of this series is to show you how not to do things. My thinking is that many bad installation practices are repeated because someone saw it done that way before and no one told said person it was wrong. Surely, if you knew it was wrong, you wouldn't do it this way… right? In that spirit, here we go. Our fist installment is a run of Cat-5 cable. 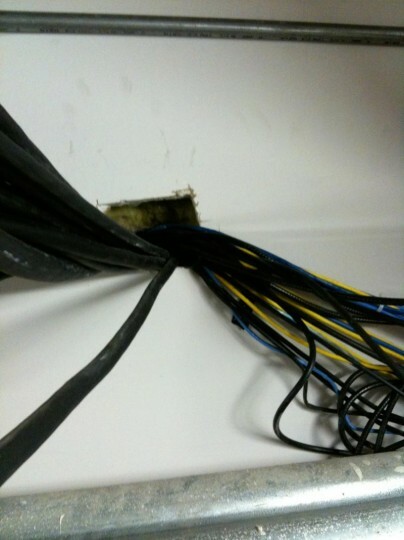 The cable comes up from a lower floor into a pull box; and it comes up in a conduit. That's where things get weird. I'm not sure if they found pulling the cable through the conduit just too dang much work or what, but instead of continuing on out through the conduit at the top of the box, they punched through the side of the box and tie-wrapped to the conduit. I'm not kidding. Easier than running through the conduit? Perhaps. Correct? 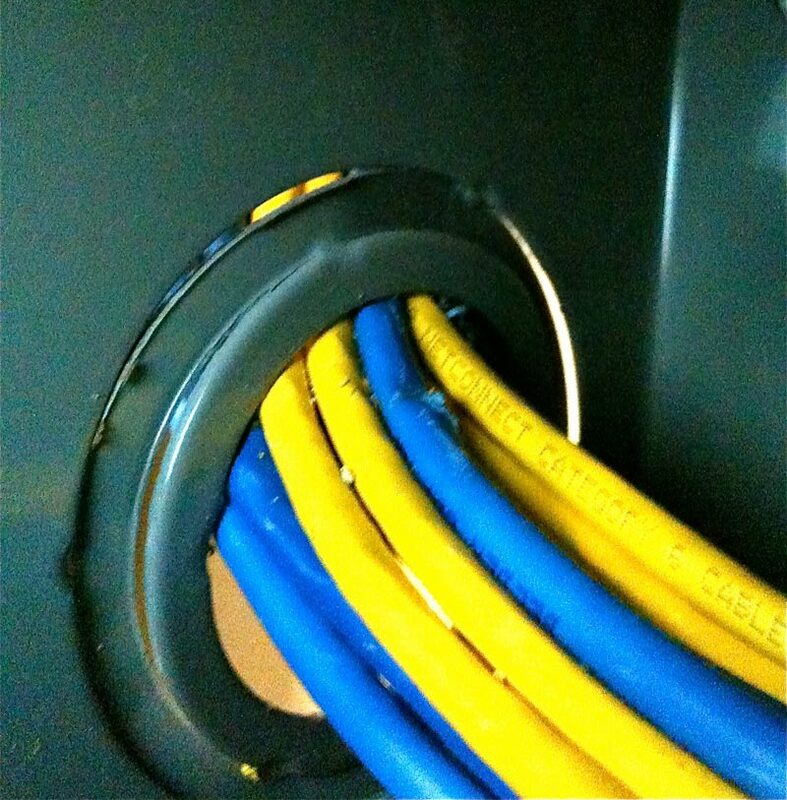 Uh, no.Now, there is a proper way to bring cable in and out of a box without using conduit. Cable clamps and bushings are two such options. Apparently, neither were handy when this cable run was done. And in case you're wondering what might be wrong with pushing cable through a box in this manner, take a closer look from inside the box. See those nicks in the insulation? They'll get worse with time as the building vibrates.Those sharp edges on the box will gradually cut through the cable as the building vibrates. It may take a while, but the wire will eventually be compromised. They also pulled rather tight, which puts pressure on the cable, another no-no. Finally, after continuing up the outside of the conduit, the wire goes through a fire-rated wall; a big no-no. This is the kind of stuff that will get you shut down if you have a fire inspector with a limited sense of humor. There are proper ways to go through a fire-rated wall. This is not one of them.This Installation Fail has a lot going for it (perhaps more correctly, not going for it). The sad thing is that it was installed by a company that does cable installation. Meaning, this was not the work of some well-meaning but uninformed volunteers. Nope, this was a "professional" job. And frankly, that irritates me.